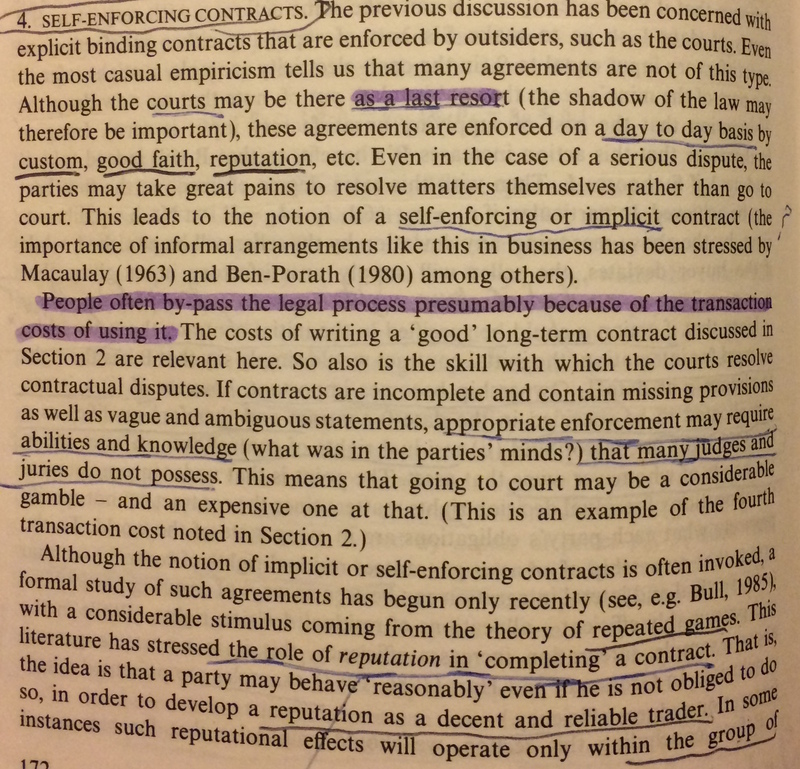 Just because your contract has enforced itself automatically, that doesn’t mean that courts don’t get any say. They can order you to un-enforce it, or to pay damages for enforcing it wrong. It’s not that the courts don’t get any say, it’s that it’s not economically rational for the courts to have any say. 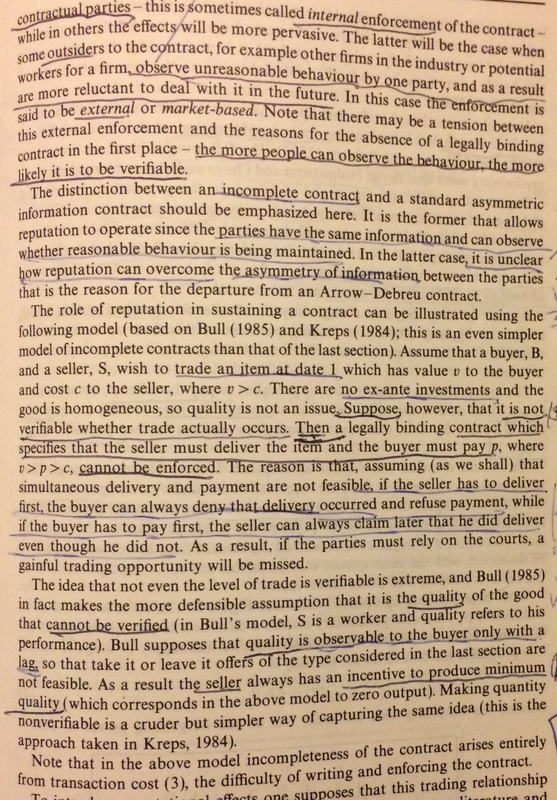 Oliver Hart’s 1989 paper on incomplete contracts talks about “self-enforcing contracts” . Not smart contracts or anything on the blockchain, but the fact that people mostly do the things described in a contract without a court order and a pointed gun. This is largely motivated by the assumption that it’s cheaper NOT to go to court. If I don’t make my monthly car payments, a repo man will take my car. And maybe I can hide the car in the backyard for a few days, but that just means the repo man has to obtain a court order that forces me to not only return the car but also pay for the associated costs. If I still ignore THAT, then I go to jail. Most people anticipate this sequence of events so they do what they promised without getting the courts involved. A smart contract that disables a car’s starter after a missed payment simply replaces the steps between the repo man and the court order. Levine points out a case where someone missed a car payment (or three) and the creditor used a starter interrupt device to disable her car. So she sued the creditor. The starter interrupt device worked exactly right! Asking a court to enforce (or un-enforce) a contract is expensive, and someone has to bear the cost of taking the case to court. In this case, the starter interrupt device placed the burden on the person who breached the contract. Without this device, it’s the job of the creditor to hire a repo man and deal with the cost of repossessing the car. By removing the burden of lawsuit from the creditor, lenders will have a lower cost of lending, and be able to offer lower rates and provide more loans. Repo men don’t have a perfect recovery rate, which makes it hard for a lender to assess a transaction’s risks and set appropriate rates to accommodate the allocation of costs. Smart contracts offer accurate loss expectations that mean creditors are better able to repackage the loans, sell the debt, increase bond market liquidity, and avoid a potential subprime-auto-loan financial crisis. Or maybe you think that technological determinism is bad, because a computer can’t have the warmth and compassion of a repo man. That’s fine! Not everyone needs to use a smart contract or agree to have a starter interrupt device! There’s an unfortunately popular notion that smart contracts are standalone agreements that exist as “immutable, unstoppable, and irrefutable computer code.” I blame the idiots who created the DAO. The fact that no one has turned to the legal process doesn’t mean that they live in a techno-utopian absolutism; it just means that going to court is a gamble that no one wants to bet on. A smart contract can shift the burden of lawsuit, but it can’t shift the law.